On May 9 2016, almost the entire planet will get to experience a rare treat - a transit of Mercury across the Sun. That's the astronomical name for what happens when Mercury's orbit brings it between the Earth and our star, casting a tiny black shadow across the solar disc. It's been a decade since the last time it happened, making it a somewhat unusual event. But with a little preparation, and some care, it's very possible to watch the celestial ballet taking place. The easiest way is to find a local astronomical viewing event. If there's an observatory or astronomy club near you, then check to see if they're holding a viewing party of some sort - that'll be the best, and safest, way to easily see it. Plus you'll get to enjoy expert commentary and analysis. If that's not possible, though, it's pretty easy to sort out your own viewing party with only some basic astronomical equipment. You won't be able to see it with the naked eye. In fact, don't even try - looking directly at the Sun is very dangerous and can result in severe damage to your eyesight. Even with sunglasses or eclipse glasses, you won't see anything - the Sun is too big and bright, and Mercury is too small. Instead, you can project the image of the Sun onto a piece of paper and view it that way. Get hold of a telescope or pair of binoculars with a magnification of 50x to 100x, along with a tripod, some duct tape and a few large pieces of stiff white card. First, cut a hole in one of the pieces of card about the same size as the front of the telescope or binoculars - you're going to use this as a light shield. If you're using binoculars, you only need one of the lenses. Tape the shield to the front so that the lens pokes through but the light around it is blocked, and seal any leaks as best you can using duct tape or something similar. Getting the positioning right will take a little time and effort, so be patient if you're having difficulty and keep trying - the entire transit takes seven and a half hours, so there's no rush. You'll know you've got it right when a bright circle appears on the card, at which point you can focus the binoculars or telescope to get it properly in focus. Then all you need to do is look for a small black spot on the surface. That's Mercury - which should be visible from 12:12pm in the UK (7:12am EDT), ending at 7:41pm (near 2:41pm EDT). If you're watching for a while then you'll need to adjust the tripod over time to account for the rotation of the Earth, and it's also probably a good idea to give the lenses a break every so often to cool down to prevent damage. If it's cloudy? Well, you're out of luck. But Nasa and other national space agencies will no doubt be streaming the transit online where you can benefit from the same expert commentary that you'd get from your local astronomy club. As well as enjoying the beauty of the event, astronomers will also be using the opportunity to watch light pass through Mercury's thin atmosphere and in the process learn about how the Sun interacts with different bodies in the solar system. Oh, and if you're reading this after 9 May 2016, don't fret. 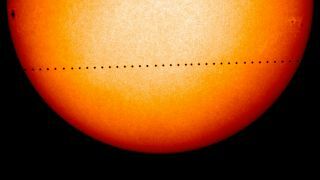 The next opportunity to see Mercury crossing the Sun will be on 11 November 2019. Mark it in your calendar, because after that you'll need to wait until 13 November 2032.